Petrides, K. V. (2019). In Zeigler-Hill V. & Shackelford T. (Eds.) Encyclopedia of Personality and Individual Differences. Springer, Cham. supervision of Dr. Paul Barrett. He is one of the very last co-authors of Hans J. Eysenck (Barrett et al. 1998a, b). While working on the major publication of Barrett et al. (1998b), Barrett encouraged him to pursue a PhD on a list of possible topics, including the newly popularized concept of emotional intelligence (Goleman 1995). His PhD proposal to develop a new operationalization and measure- ment of emotional intelligence (trait emotional intelligence) was accepted for supervision at four universities (Edinburgh, Goldsmiths, Oxford, and UCL) and received funding from the Economic and Social Research Council (ESRC), the main funding body of psychological research in the UK. Petrides started his PhD at UCL under the supervision of Professors Adrian Furnham (at the time, Europe’s most proliﬁc psychologist) and Norah Frederickson. The former acted as main supervisor and mentor throughout the PhD years, while the latter would later on be instrumental both in his appointment to the UCL faculty as well as in his promotion to full Profes- sor. His PhD research (Petrides 2001) proved highly successful, yielding a string of signiﬁcant publications (e.g., Petrides and Furnham 2001, 2003; Petrides et al. 2004) that ultimately established trait emotional intelligence as an independent ﬁeld of psychological enquiry. Upon completing his PhD in 2001, and following a personal, ESRC-funded, post-doctoral Fellow- ship at UCL mentored by Professor I. C. McManus, he was appointed Lecturer in Educational Psychology at the (then independent) Institute of Education, in 2002. While there, he published what is currently his most inﬂuential article on trait emotional intelligence (Petrides et al. 2007) and also established the London Psychometric Laboratory (LPL; www. psychometriclab.com) in order to organize his research activities, and associated commercial applications. During this time, he signed the ﬁrst licensing contract for the Trait Emotional Intelli- gence Questionnaire (TEIQue), which went on to become a global leader in psychological assessment. The instrument is used across the board in research and commercial settings in many of the world’s leading hospitals, universi- ties, and conglomerates. In 2008, following an invitation from Norah Frederickson to join her team, Petrides was appointed Reader in Psychology and Psychomet- rics at UCL. This proved to be a catalyst for the activities of the Lab, which expanded into multi- ple research domains, including business, clinical, educational, health, military, and social psychol- ogy as well as in the areas of behavioral genetics, management, medicine, neuroscience, nursing, and sports science (e.g., Petrides et al. 2016). During this time, he also published his second major theory, viz., belief-importance (belimp) theory (Petrides 2011). In 2016, Petrides was promoted to Professor of Psychology and Psychometrics, thus becoming the ﬁrst-ever Professor of Psychometrics at UCL, which is where psychometrics was originally created by, among others, Francis Galton, Charles Spearman, Karl Pearson, and Cyril Burt and whence celebrated psychometricians, including Raymond B. Cattell and Hans J. Eysenck, had graduated. He is author of over 100 peer-reviewed publications, mostly on his theories, many of which have become heavily cited (e.g., Allik 2013). He has reviewed for scores of journals (in ﬁelds as remote as accounting) and sits on the editorial board of many others. In 2017, he was elected Secretary-Treasurer of the Interna- tional Society for the Study of Individual Differences. He has trained and mentored numer- ous PhD students all of whom went on to success- ful careers, including full-time academic appointments internationally. In addition, he has hosted in his Lab research visitors (PhDs to Professors) from all over the world. Petrides has achieved recognition mainly through his work on trait emotional intelligence, which has attained worldwide prominence. He is widely known for his contributions to psychomet- rics and personality theory as well as for the TEIQue family of instruments. However, these are speciﬁc manifestations of much more fundamental theoretical and research concerns with which he has been preoccupied since high- school. Petrides is particularly interested in phi- losophy of mind (both Eastern and Western), clas- sical Greek and Jewish philosophy, philosophy of science and statistics, and psychoanalysis (especially Reichian approaches). While these interests are reﬂected in many key publications, they are discussed at length only in a select few (e.g., Petrides 2018). In 2019, he published the ﬁrst presentation of Psychobionomy (Petrides in press), a general system that aims to discover and apply laws governing the mind, which he views as the source of all life. The system’s label represents a combination of the Greek words “Psyche,” which means soul or spirit, “Bio,” meaning life, and the sufﬁx “-nomy,” which has the dual mean- ing of arrangement and law. The system of Psychobionomy is depicted in Fig. Petrides, K. V., Fig. 1 An illustration of the system of Psychobionomy. The illustration is intended to convey general principles and, as such, entails a degree of ﬂuidity in its application. The Generic Ground of Pure Knowing underpins and permeates the four stages of human experi- ence as well as all of their aspects. Thinking emerges as stage 1 in the system and underpins the three stages that follow it. This stage comprises pure thought, but also the primary concepts of the individual’s psychological reality, including all of the self-perceptions that give rise to their personality (Self-construct) as well as the desires, fears, needs, etc. that are buried inside the individual’s subcon- scious. Feeling emerges as stage 2 of the system through combinations of thought patterns from stage 1 coupled with energetic movements in the body. It has a major impact in directing and inﬂuencing perception in the phe- nomenal world. 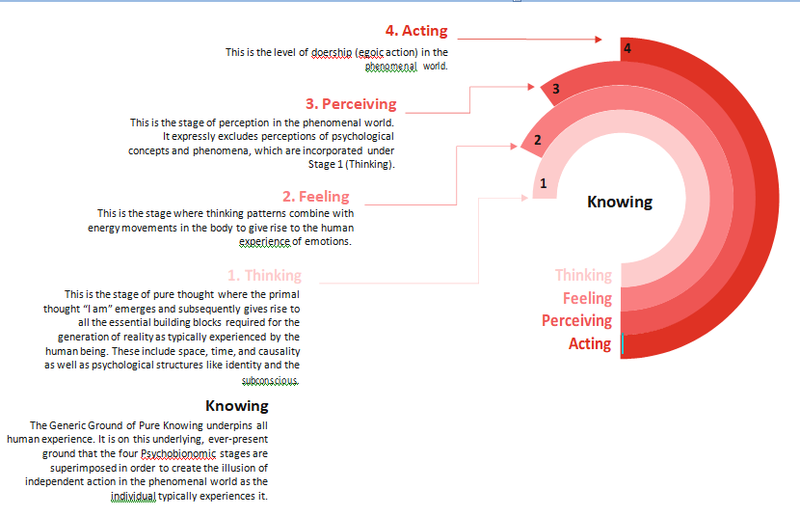 Perceiving emerges as stage 3 and con- cerns perceptions in the phenomenal world (e.g., which aspects of the world the individual directs attention to and how they choose to interpret them). It excludes, however, self-perceptions and perceptions of inner phenomena, such as Self-construct, which fall under Thinking (stage 1). Last, Acting emerges at stage 4 and concerns typically experi- enced doership as an independent actor in the phenomenal world. Each stage depends on the stages that precede it, but not on those that follow it, and all stages are dependent on the Generic Ground of Pure Knowing, which exists completely autonomously. Progressively deeper hues are used in the depiction of the stages in order to signify the greater levels of conditioning associated with each stage. Psychobionomy spans the entire range, from the wholly unconditioned Generic Ground of Pure Knowing all the way to wholly conditioned action in the world, burdened by the full weight of habituated beliefs, opinions, and intellectual commitments. 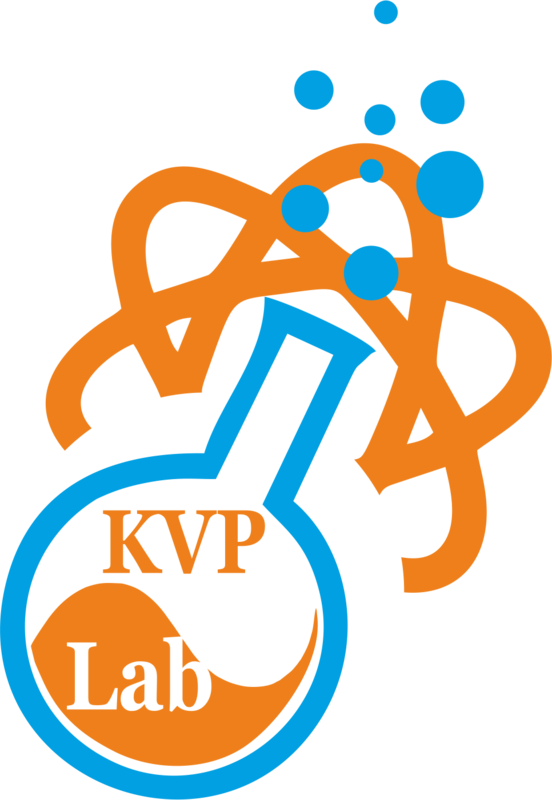 (© K.V. Petrides 2018 – London Psychometric Laboratory. All rights reserved) ourselves, others, and the world, but it is literally created by them. In this philosophy, psychomet- rics is seen as a means to a higher end (entry into the deeper psychological world), rather than a means to mundane ends (e.g., business, clinical, or educational outcomes, which are far easier to attain compared to Self-Knowledge) or an end in and of itself (e.g., psychometrics as the poor man’s applied statistics). Methodologically, self- report measurement is seen as not simply indispensable but as the only way to achieve observational contact with mental life and, hence, necessarily commanding primacy over all other methodological approaches. Petrides’s ideas have transformative value and potential for the individual human being. Rather than intellectual and statistical abstractions, they represent true psychology ﬁrmly rooted in its philosophical origins and uncontaminated by research fads or the prevailing materialistic approaches that futilely attempt to reduce primary psychological phenomena to derivative brain processes. His theories seek to guide the individ- ual deep inside their own mind in order to dis- cover their essential nature, a discovery that will lead to fulﬁllment, emancipation, and all-round success. Petrides continues to develop research, theo- ries, and scientiﬁc instruments in London and abroad. He lectures and delivers seminars and workshops around the world focusing on his systems, ideas, instruments, and broad topics of interest. Allik, J. (2013). Personality psychology in the ﬁrst decade of the new millennium: A bibliometric portrait. European Journal of Personality, 27, 5–14. Barrett, P. T., Petrides, K. V., & Eysenck, H. J. (1998a). Estimating inspection time: Response probabilities, the BRAT IT algorithm, and IQ correlations. Personality and Individual Differences, 24, 405–419. Barrett, P. T., Petrides, K. V., Eysenck, S. B. G., & Eysenck, H. J. (1998b). The Eysenck personality questionnaire: An examination of the factorial similar- ity of P, E, N, and L across 34 countries. Personality and Individual Differences, 25, 805–819. Petrides, K. V. (2001). A psychometric investigation into the construct of emotional intelligence. Doctoral dissertation, University College London. Petrides, K. V. (2011). A general mechanism for linking personality traits to affect, motivation, and action. New Ideas in Psychology, 29, 64–71. Petrides, K. V. (2018). On the deeper roots of trait emo- tional intelligence. In A. Scarinzi (Ed. ), Recasting aes- thetic experience: Emotions and the “continuity principle”. Göttingen: Cuvillier Verlag. Petrides, K. V. (in press). A conceptual application of the general system of Psychobionomy to the ﬁeld of personality and individual differences. Personality and Individual Differences. Petrides, K. V., Frederickson, N., & Furnham, A. (2004). The role of trait emotional intelligence in academic performance and deviant behavior at school. Personal- ity and Individual Differences, 36, 277–293. Petrides, K. V., Mikolajczak, M., Mavroveli, S., Sánchez- Ruiz, M.-J., Furnham, A., & Pérez-González, J.-C. (2016). Recent developments in trait emotional intelligence research. Emotion Review, 8, 335–341.